Miley Cyrus’ tattoo designs have been getting wackier and wackier of late, and the inked-up pop star has just revealed a brand-new tattoo on her left arm of half an avocado, proving that, as a happy hippie, she can do whatever she darn well pleases, thank you very much! In fact, when she’s not busy getting inked with seemingly random fruit designs in Australia, Miley has been spotted locking lips with Stella Maxwell, a Belgium-born Victoria’s Secret model and the daughter of an Irish diplomat. We wonder what Stella thinks of Miley Cyrus’ avocado tattoo?? The design of Miley Cyrus’ new tattoo is pretty basic: it’s a half of an avocado (the part without the pit, in case you were wondering) inked with a dark green outer skin and light green inside flesh, just like the avocado you ate with your eggs this morning. Miley has yet to explain the meaning behind her avocado tattoo, but honestly, at this point, we’ve almost stopped wondering about what some of her more random ink symbolizes. 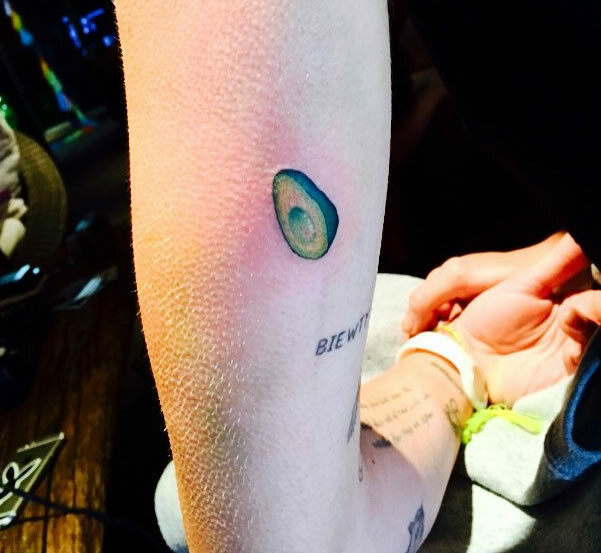 So, we aren’t going to dig any deeper into this new arm tattoo; it’s an avocado because Miley Cyrus loves avocados. You know what that means though. For all of you who thought you were super into avocados, you’ve just been one-upped by Miley Cyrus. And unless you’re willing to get the super food inked on your body, you’ll never be able to catch up to her!